Well, our “Great Circle” tour of Iceland had finished, but we weren’t quite done with Iceland, having another two days in Reykjavik to explore. With our various diversions on our last day of driving (including a return trip to Hveragerði to take a long hike to check out the Varma (“Warm River”), fed by hot springs), we got back into Reykjavik rather late and several places were booked solid for dinner (it was a Friday night), but we didn’t have too much trouble getting Sjávargrillið (“Seafood Grill”) for dinner. 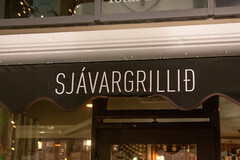 Sjávargrillið is one of the up-and-coming trendy restaurants in Reykjavik (the head chef was Iceland’s 2010 chef of the year), but it’s menu is still pretty approachable: the primary theme of Sjávargrillið is “Icelandic Seafood”, with a nice variety of fresh and smoked seafood dishes, but they also offer several “Feasts”, including their “Grill Party” (basically a chef’s choice multi-course special), a lobster feast, and a “Taste of Iceland” feast (puffin, shag, and minke whale). While all of these were very tempting, we ended up settling on the daily special, the perch. Unlike Arctic Char (which I think worked it’s way into about half of my meals in Iceland), I hadn’t had a lot of perch, so this was a nice changeup. 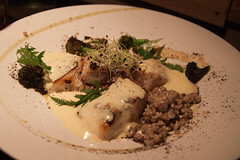 And it was a very excellently done (like I’ve said before, my theory is that overcooked fish is an extraditable offense, since we never saw it in Iceland, every piece of fish was cooked to perfection). Served up with a nice cream sauce over a bed of barley, this wasn’t a particularly fancy dish, but it was a thoroughly enjoyable one. It was the perfectly light dinner for us, although we were constantly amazed by some of the feasts of tables around us. 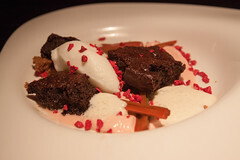 Dessert was pleasant as well: warm chocolate cake with walnut, raspberry, yogurt, and rhubarb (and little bits of what appeared to be free-dried strawberry as well). Apparently “warm chocolate cake” is the in thing, since we saw it on menus almost as often as arctic char and skyr. Resembling something halfway between cake and a brownie, this was a somewhat dense but delicious cake, nicely complemented by the yogurt and rhubarb. Sjávargrillið was a bit pretentious at times (for example, serving up the bread with a cold lump of butter delicately balanced on a lava rock, which had a tendency to tip onto the table when you tried to carve some off with a knife), but it was otherwise a fine spot for a dinner: a nice staff, a good menu, and some food perfectly cooked and nicely presented. It’s on our short list for a return visit, hopefully on a nice evening when we can sit outside and look at Hallgrimskirkja.